Everyone knows how tricky it can be trying to find a time to meet up with friends and colleagues. Everyone has so much going on in their lives and plans are constantly changing. Even when you live in the same city as a group of friends, or work in the same office as your colleagues and business associates, finding a free slot for you all to meet up for drinks or a meeting can soon become a nightmare. Doodle combats this problem by providing online booking software which allows each friend or colleague to enter in the times that they are free into one common poll. The poll can be sent to as many people as you like, and once each person had added in their available time slots it will be easy to see when the best time to meet is. When plans change, a participant can simply alter their details in the booking software and the administrator – that is the person who set up the poll – will be notified of these changes. Doodle does away with the confusion and complication of trying to organise events on email threads or on social media and replaces it with easy, simple-to-use, free booking software. Anyone can use the Doodle booking software and it’s free to create a basic poll. Once you are on the site you need only click on the ‘Schedule an Event’ tab to begin. You will next be taken through some straight forward steps asking you to add some principle details about the event (name and location for example) and the potential times that you all can meet. The free online booking software also allows you to add a number of extra features to your poll. For instance, you can offer the option of ‘Ifneedbe’ alongside that of ‘yes’ and ‘no’, when the participants are marking their availability for each time. You can make it so that each participant can only see their own name and response to the poll. In addition you can allow the participants to add comments. 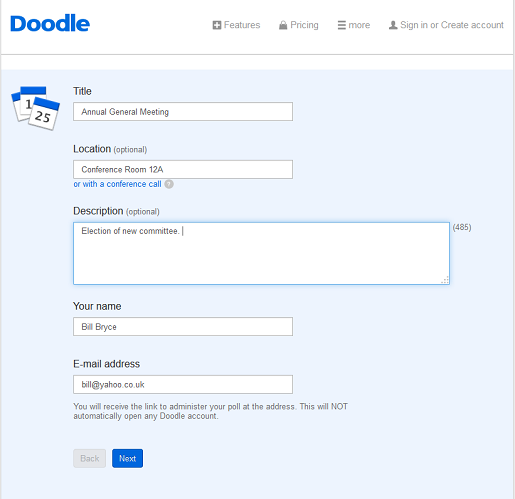 Doodle can also be used as appointment booking software, as there is another handy feature which enables you to limit your participants to book or reserve only one time slot. This is particularly useful if you’re a teacher or professor who is arranging times for your students to come and meet you. It may also be handy if you are a team leader or manager in a company, or run events with different volunteers. There are a number of other notable features that come with the booking system software for free that ensure you get the most out of your booking experience. While we recommend that inviting participants to your poll is best done via email if there is only a select few of you, for larger events we offer the option to share the poll via Facebook and Twitter. With a premium account you will also be able to view the poll in the form of a calendar, allowing you to better gage when you are free. 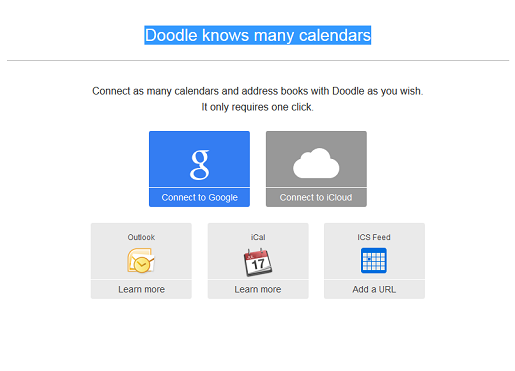 This is particularly useful if you have connected your online calendar and address books to your Doodle account, as seen below. This way, you won’t have to switch back and forth between your calendar and the Doodle poll but instead instantly see when you are available.